A series of construction projects - including a railway, expressway, airport and logistics center - are aiming to transform Chengdu into a traffic and transportation pivot in China's central and western region. The Standing Committee of Chengdu Party committee recently approved an outline to guide the future development of the city's traffic and transportation sectors. It is the first city in the country's central and western region to map out such a plan. Chengdu's existing infrastructure is inadequate for a traffic and transportation hub, which requires a comprehensive system of railways, expressways, airlines and other supporting facilities. Therefore, the outline focuses overwhelmingly on infrastructure construction. According to the outline, seven more railways and expressways and two more inland navigation lines will be built. All these projects are alluring indeed to infrastructure construction enterprises. Some experts estimate the capital involved may reach hundreds of billions of yuan, though some projects are still under discussion. But competition for a piece of the action is fierce. Local companies must take prompt measures to improve management and production standards if they want a share. "Currently, the logistics industry in Chengdu faces two main problems," says Liu Jianxiong, secretary-general of the Chengdu Logistics Association. "The first is cost increases due to rising labor and fuel prices. The other is low concentration level, as small- and medium-sized enterprises lacking modern management make up the majority." The construction of a traffic and transportation hub will directly benefit the logistics industry. According to Liu, a convenient traffic network will firstly attract more logistics businesses to Chengdu, providing the possibility to form large-scale enterprises. Secondly, the current companies will be driven to improve their management in order to survive in new market environment. "In that case, the cost of logistics will indeed be reduced," Liu says. Due to rising costs in labor and raw materials, more manufacturers have in recent years moved from southeast China to the central and western regions. Chengdu has already received many shoe and toy manufacturers from the Pearl River Delta. But how to keep these manufacturers as competitive in foreign trade as before? In response, Chengdu will open more international airlines and two transportation networks going through Luzhou and Yibin ports to the Yangtze River and then to the sea. In addition, direct cargo trains from Chengdu to Shanghai, Guangzhou, Shenzhen, Qingdao, Lianyungang and Tianjin will be opened to improve transportation efficiency for manufacturing companies. It currently takes five or six days to transport goods by train from Chengdu to Shanghai and eight or 10 days by ship. Once the inland hub is completed, the process will take just 48 hours. The outline reveals some significant plans for the development of the city's aviation industry. First, Shuangliu Airport, the fifth-largest airport in China, transporting 16 million passengers annually, will continue to grow. A second runway and a new departure hall are under construction. The finished second runway will be capable to land an Airbus A380, currently the world's largest civil airplane. Chengdu also plans to build a second airport in Jintang with six runways. According to some industry experts, the Jintang Airport will bring Chengdu's aviation industry to a higher level. There is presently an obvious gap between Chengdu and aviation centers like Beijing, Shanghai and Guangzhou. 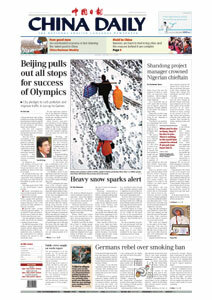 But Chengdu has a geographic advantage in the western region. With Chengdu as a transfer station to other cities, it presents an opportunity for feeder airlines. Flights from Chengdu to feeder airports such as Daocheng, Kangding and Leshan will be opened in the near future. Small- and medium-sized airline companies will then receive more development opportunities. Moreover, some 10 more international flights directly to Chengdu will make Chengdu the city with the most international flights in West China. In the opinion of Shao Fan, the manager of the Chengdu Guangda Travel Agency, the two most important factors attracting tourists are rich tourism resources and a convenient transportation system to "enable tourists to experience more with less time". Statistics show that during the first three quarters of 2007, the number of domestic tourists visiting Chengdu reached 39.7 million, a 16.3 percent year-on-year increase, the income from which was 3.092 billion yuan. Chengdu and its neighboring regions have already boasted an innate advantage in terms of tourism resources and traffic system. A railway from Chengdu to popular tourist attractions such as Jiuzhaigou and Lhasa will also be opened. Meanwhile, Sichuan province plans to build an expressway network with Chengdu as the center. The 8,000 km expressway will link Chengdu to all the province's cities with a population above 150,000. Real estate and urban development are indirect beneficiaries of the plan. It will take less than 30 minutes to travel from Jintang to Chengdu downtown area. More people will then be willing to work or live in Jintang, which will help reduce pressure on population and traffic in the downtown and develop the economy in suburban areas. As a result, the city scale will grow and real estate will enter a new phase of development. 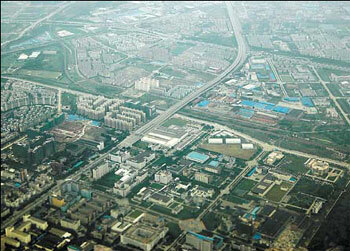 The Great Chengdu Economic Zone will also receive more opportunities. A two-hour traffic circle will connect Chengdu and Guangyuan, Dazhou and Yibin, and a one-hour traffic circle will connect Chengdu and Suining, Neijiang and Leshan, further bringing Chengdu and neighboring areas into an integrated zone.